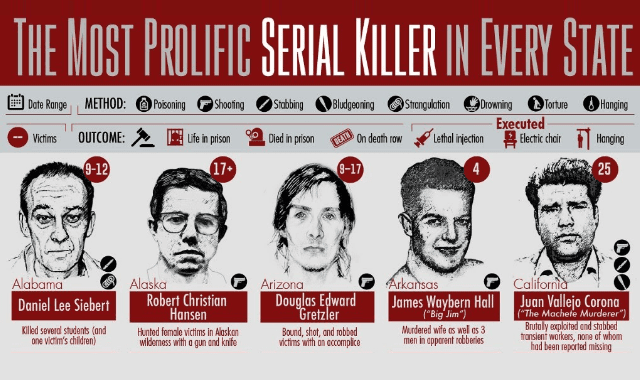 The Most Prolific Serial Killer in Each State #Infographic ~ Visualistan '+g+"
According to the FBI, there are up to 50 serial killers operating in the United States at any given time. That averages one serial killer per state. Chilling thought, isn’t it? This graphic from Security Baron explores the most prolific serial killer in every US state. The rankings are based on the number of victims in a given state by a single killer. Washington State, for example, was the killing ground for perhaps the country’s most prolific serial killer: Gary Leon Ridgway, aka “The Green River Killer.” With 49 confirmed victims (and possibly more) in WA, The Green River Killer terrified Washington residents from 1982 – 1998 before being caught. He is currently serving life in prison. In addition, this graphic from SecurityBaron.com displays data about each killer, including: their Modus Operandi, method of killing, whether they were caught or convicted, and whether they were executed, are on death row, died in prison, or are serving life in prison.